Across the AEC industry, the non-technical skills possessed by organisations are key to their overall performance. In this study, the particular importance of optimising the so-called "soft power" of organisations, is addressed. Things like organisational culture, responsible corporate behaviour, and building trust-based relationships with other stake-holders are seen as facets of a broader organisational capability, and the advantages of this strength are also explored. The internationally conducted research behind this book will provide readers with new insights into effective management, from both inter and intra organisational perspectives. This unique and important book is essential reading for researchers and advanced students of construction management. Sai On Cheung is a chartered quantity surveyor by profession. Before joining academia, he had substantial experience in contract administration with both consultant office and construction contracting organisations. 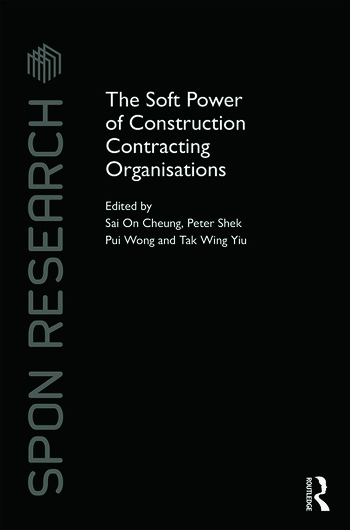 Building on these experiences, Professor Cheung established the Construction Dispute Resolution Research Unit (CDRRU) and has developed research programmes in organisation issues in construction, contract and dispute management. He has also published widely in these areas. He has received two CIOB awards for his research in construction partnering and use of information technology to minimise dispute. A collection of his research in dispute management was published as the research monograph Construction Dispute Research in 2014. In addition, Professor Cheung is a recipient of the 2010 City University of Hong Kong Teaching Excellence Award. Peter Shek Pui Wong is a Senior Lecturer at the RMIT University, overseeing the quantity surveying-related courses the university offers in Australia, Singapore and Hong Kong. Before embarking on his academic career, Dr Wong worked as a quantity surveyor with Rider Levett Bucknall Ltd, and was involved in a number of prestigious construction projects. He has a proven track record of publication in reputable construction management journals. He is a founding member of the Construction Dispute Resolution Research Unit (CDRRU) and the cluster leader of the greater China region of the Research Centre for Integrated Project Solutions of the RMIT University. He fosters a strong linkage between applied research and the industry. Tak Wing Yiu is a Senior Lecturer in the Department of Civil and Environmental Engineering at the University of Auckland, and previously he worked in the field of quantity surveying. He is a founding member of the Construction Dispute Resolution Research Unit (CDRRU) and has conducted construction contracting, negotiation and mediation research for more than 10 years. He has built a proven track record, and most of his research outputs have been published in the top journals of these areas. Dr Yiu was a recipient of the 2012 ASCE Best Forum or Synopsis Paper Award and recognized as 2013 ASCE Outstanding Reviewer.